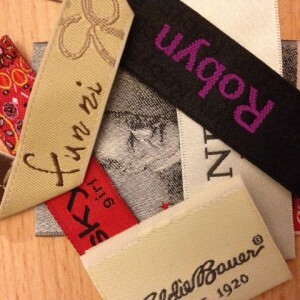 How woven labels are being made? 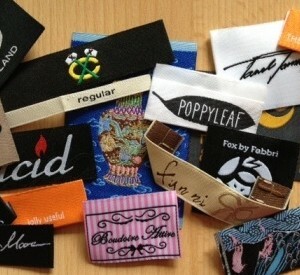 The narrow fabric loom creates woven labels. 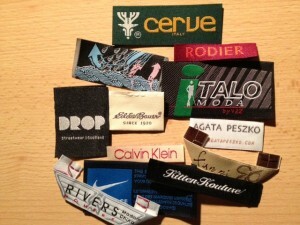 One fabric woven label can have up to 12 coloured threads weaving on it. The loom weaves different coloured threads on a netting base, to create the weaving image. 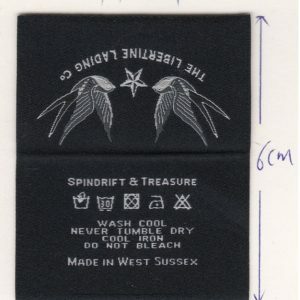 The result on woven label is not going to be the exact result as on paper printing artwork. 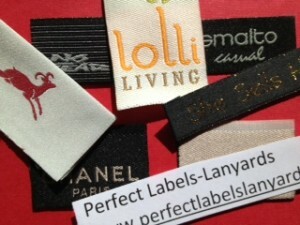 Here at Perfect_Labels_Lanyards, we use extra thin threads, and we apply digital high-density weaving solution to create a similar paper printing result. 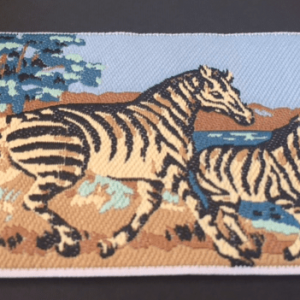 However, the volume of threads use on woven label affects the price; it means that the more colours you have on a woven label design, the more the costs is putting up. 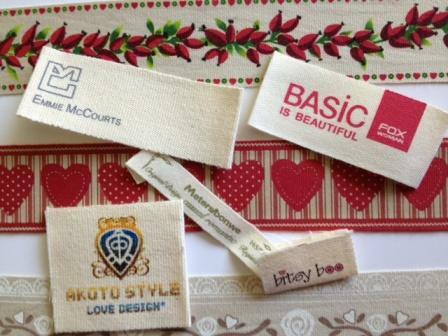 Woven Label dimensions are usually a very small fabric tag to sew into your designer clothing. Most popular, effective woven label design is designer woven brand name (logo) in one writing colour, on a solid background colour. It is a simple design but effective! It focuses only on the brand identification: name & logo. 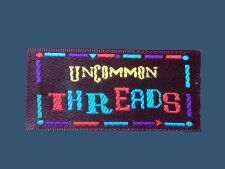 As above-mentioned, the loom creates weaving image, although we use ultra-thin threads, and apply digital high-density weaving solution, we still suggest customer to design their woven label with text at least 2 – 2.5 mm in height/width, in order to achieve legible woven text. To be successful to start your own trendy clothing line business, first you need to be crazy about fashion and clothes, and then you need to have an acute business instinct, a genuine interest in the clothing industry. 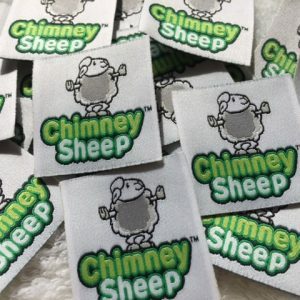 You need to find your own niche in the apparel market and furthermore you need to choose a professional garment label manufacturer to customize an unique style of your designer clothing label. Our factory started up with personalised garment labels, it is our specialty and we share this specialty with our valuable customers. 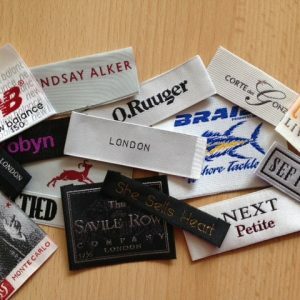 We are able to produce personalised garment labels to your exact specifications including size, colour, design and text creating the perfect personalised garment label. 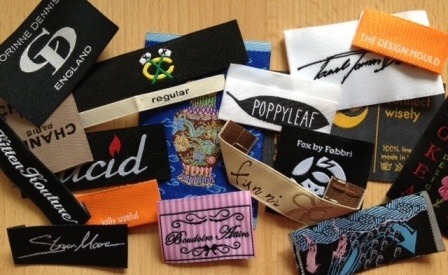 There are many uses for personalised garment labels whether you are a dressmaker, designer, large clothing company, small clothing company or if making clothes is simply your hobby and passion. If you are looking for the perfect labels company to design and produce your bespoke clothing labels then look no further than us. With a wide customer base including large clothing companies, designers, clothes makers and individuals we have the knowledge base and skills to produce your perfect bespoke clothing label. 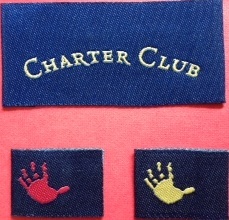 All of our bespoke clothing labels are finished to the highest standard using quality materials and finishes. You can design your bespoke label from scratch including size, colour, text and images creating a truly unique bespoke clothing label that represents your company or image. Why not take a look at our range of customer comments or contact us directly today to start discussing your bespoke clothing labels.